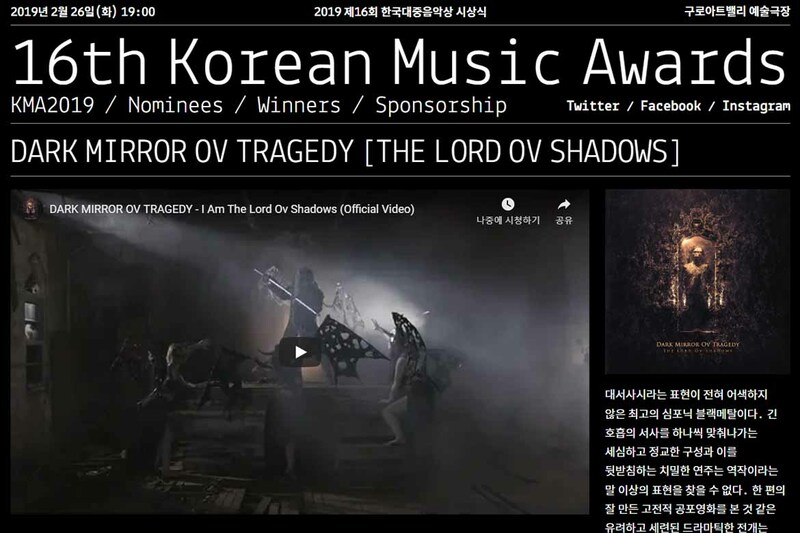 THE LORD OV SHADOWS is nominated for Korean Music Awards 2019: Best Metal Album ov The Year. Nothing but trembling despair of silence within the darkest void"
Senyt had a great interview with Czech Metal Magazine, Pařát magazine official. Pařát magazine is Printed Metal Magazine, not a webzine. And The Lord ov Shadows respects the REAL things. So no sharing full pages on Internet. Gems and ores, newborn stars of fallen angels"
With Soni, Infree Records and Dark Mirror's old brother Ethereal Sin. WAIT FOR HIM IN SILENCE. Finally we're back. It's 10 years! Thank you Hong Kong Metalheads! You're the best! Here comes the review ov The Lord Ov Shadows from Global Metal Webzine Metal Temple. The message from another place. Horns up, metalheads! See you in Hong Kong. [DARK MIRROR OV TRAGEDY] - Symphonic Black Metal from South Korea - performing live in Hong Kong March 23, 2019 for the 2nd time . They have jsut won the Korea Music Awards 2018 - Best Metal album "The Lord ov Shadow" what an amazing result. [ETHEREAL SIN] from JAPAN / [HUMAN BETRAYER] Hong Kong will be Perfoming the same night ! Here comes the interview with Korean Music Webzine Music Y 음악취향Y. Old history ov Dark Mirrir ov Tragedy, B-side story ov The Lord Ov Shadows Album... you can read many stories. The Lord Ov Shadows with one ov the greatest band in Asia, RUDRA! It is a great honor. Thank you for the warm pleasent visit by Kathir, Vinod, Shiva, Simon and their family members❤ to INFREE RECORDS Mong Kok Store. [RUDRA] being musician and metal fana purchased a CD each of what they liked from the listening session here....wow ! Other band listened to was Karmacipher, Synergy, Dagger (needed CD), Hyponic ...they could not purchase all🙏🙏 as they got some other CD from overseas labels.